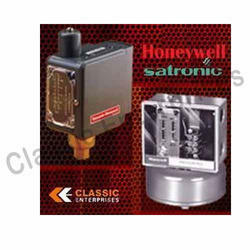 Honeywell / Satronic burner control boxes are capable of controlling and monitoring medium to high performance oil and gas burners in single or two stage versions. It can be used, as preferred, for multi-stage or modulating operation with burners of any nominal rating as well as in direct air heaters. It provides a safe light-up and shut-down sequence for the burner and incorporates pre-purge, pre-ignition, post ignition and lockout safety time intervals. The control box is designed for maximum safety in case of fluctuations in the voltage supply. The built in information system not only provides a continuous monitoring of the actual state of the control box but also informs about the cause of a possible lockout. Honeywell Modulating Motor are low voltage, reversing proportional control actuators for valves, dampers and axillary equipment. They are specially designed for industrial oil or gas burner control system. These motors are oil immersed motors and gear train provide reliable performance and long life, quick connect terminals standard screw terminal available. These motors are made of die-cast aluminum. These are pressure controllers that provide direct control of modulating motors or valves used on automatic burners or steam heating systems. These pressure controllers have two potentiometers for unison control of two motors, they also have adjustable proportioning range to allow selection of desired pressure control range. It comes with steel case with clear plastic cover to observe pressure settings and potentiometer action. Looking for HONEYWELL Flame Detectors and Burner Controllers ?